The theater of Baldracca or of the Dogana was one of the oldest in Florence: it was open since 1576. Its construction is attributed to Bernardo Buontalenti, that at the time was the court architect. It was located in a building which stands on the river bank, connected to the Uffizi on the side of Via dei Castellani. The palace was, at that time, home of the New Dogana (Customs), near the Arno river. For this reason, the theater was also called theater of the Dogana. The name \"Baldracca\" derived from that of the neighborhood in which it stood: before the construction of the Uffizi Palace, the area was disreputable and full of taverns, brothels and whorehouses. Hence, the name of the theater! Why it arose in a similar area? Because at that time the plays were not well-liked. The Catholic Church, in fact, had called them sinful and demonic. The theater was also known as \"Stanzone delle Commedie\" (the big room of Comedies). We must not imagine a modern theater, but a big room with a slightly raised stage. The audience watched to the shows standing up, or sitting on long benches. The Grand Duke and his friends could watch the shows in secret. There was a box seat provided with gratings, which faced on the room. Through the grates, the distinguished spectators could see the stage without being seen by others. The shows were often very licentious, so it was considered not appropriate - for the Grand Duke and his family - to be present. The theater did not remain active for a long time, because in the meantime some others were built in Florence. Its example was very important for the history of this art in Italy. 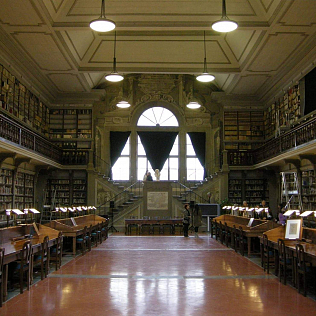 The building that housed the theater is now home of the important Uffizi Gallery Library.